The three most dangerous jobs in America: (3) Lumberjack, (2) Fisherman, (1) Eagles QB. If Mark Sanchez starts in place of Sam Bradford next Sunday, as expected, it will mark the seventh consecutive year in which the Eagles' quarterback did not start all 16 regular season games. Team Last season QB started all 16 games Who was it? 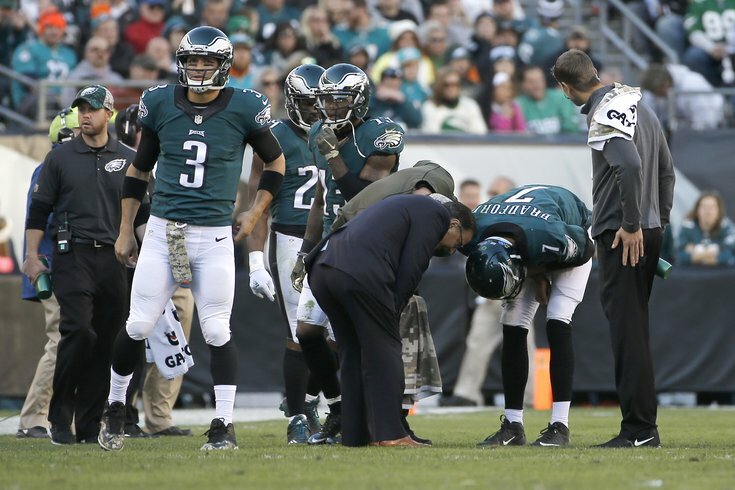 Part of that is because the Eagles have had injury-prone quarterbacks. Part of that is because they have had quarterbacks who have sucked. Sometimes it has been both. Some of it is luck, some isn't. The reality is that the Eagles have had, and continue to have, one of the most unstable quarterback situations in professional football. A week ago we wrote that Chip Kelly hinted that he wants Sam Bradford to be the Eagles' quarterback next year. No matter what happens with Bradford at the conclusion of this season, the Eagles need to make the quarterback position an extreme priority in the draft. That player would preferably have some skills, or at a minimum, be able to stay upright for a season. That's how low the bar is at this point.